Right in front of the world’s largest courthouse is Brussels’ largest square, almost 8000 square metres. Some say it is the best place to first visit on your Brussels trip, especially at sunrise or sunset. There ought to be glass elevator nearby; take it up to the top for outright best view of the city. The city centre, the Atomium, the Palais of Justice are all laid out in front of you. In the square itself, at the very centre, is the Monument A la Gloire de l'Infanterie Belge, dedicated to Belgian soldiers who died in WWI and WWII. 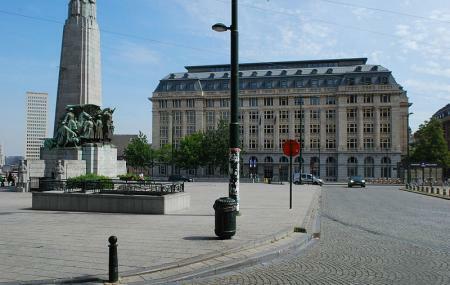 In Belgian pop culture the square is known for its prominent role in the movie Dikkenek. For the exact location of the elevator, search ‘Ascenseur des Marolles’ on Google Maps. Subway 2, 6; Buses N06, N08, N09, N10, N11 stop Louise. Trams 92, 93 stop Poelaert. Trams 92, 97 stop Stephanie. Buses 27, 48, N12 stop Jeu de Balle. How popular is Place Poelaert? People normally club together Notre Dame Du Sablon and Bois De La Cambre And Foret De Soignes while planning their visit to Place Poelaert.